﻿ DJ booth made from scaffolding pipes and tube clamps, DIY construction. 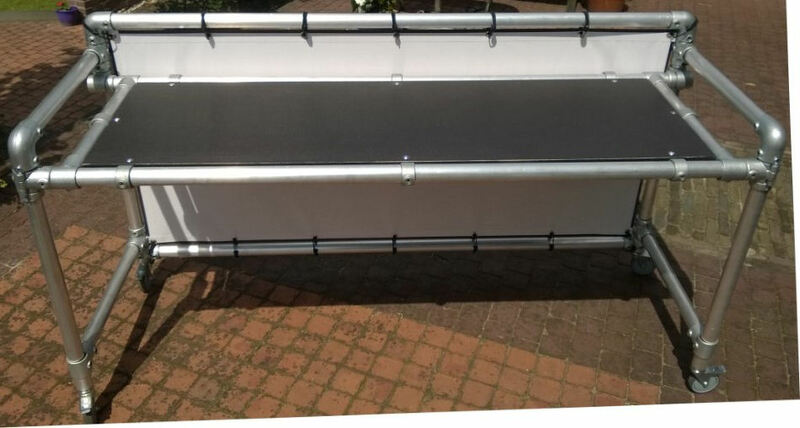 Easy assembly of a DJ booth that is easy to transport. 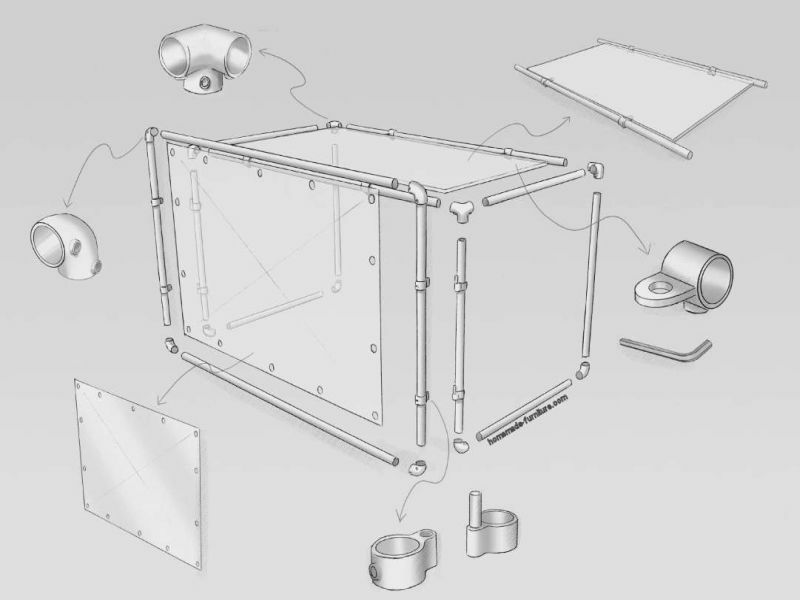 The booth can be dismantled in three parts. Fit the discjockey workspace in less than 10 minutes. DJ booth made from scaffolding pipes and tube clamps, DIY construction. 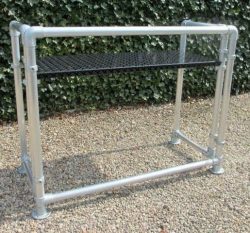 Free furniture plans » How to make furniture with a tube frame from scaffold pipes. 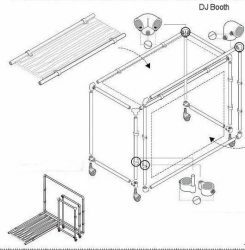 » Easy transportable booth for DJ. We also have an example how you can fit these booths on wheels, that makes the transport even easier. These are the connection pieces that you will need to make the booth. Parts list for this construction plan. 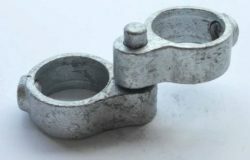 The tube connectors – pipe clamps. Four Three-way knee corner pieces. Eight knees in 90 degrees. Four board clamps to attach panels. Plus four hinges consisting of a pin part and the corresponding eyelet. Thicker tubes look a lot better. Aluminium tubes are available in many colours. 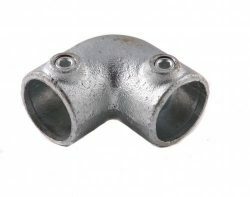 Steel tubes have different sizes than aluminium pipes. 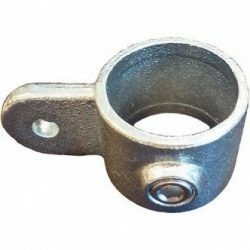 Choose whether you want galvanised tubes or coloured aluminium tubes. The first are a lot cheaper, the latter look better and they are available in several colours. 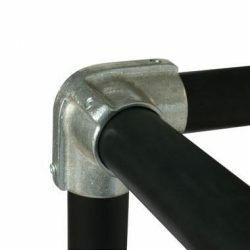 Steel weighs considerable more than the aluminium scaffold pipes, and that makes the transport a lot easier. The length for these tubes depends entirely on your demands. Probably he height for the DJ booth will be close to 85 cms. Therefore you will need four tubes of about 85 cms. Plus four tubes for the width (Two under the top and two on the floor) and four to make the depth of the booth. As an example we made the following list with sizes to cut your tubes. Firstly 4 x 85 for the legs. Plus 4 x 70 for the depth of the DJ booth. And four tubes for the width, say 120 cm. 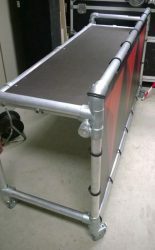 The next do it yourself construction example shows how to make a DJ table on wheels. A very similar structure for the frame, but even faster to assemble.